I was working a respectable job as a clerk in an attorney’s office who specialized in estate planning. It was quiet but paid well, and with the ounce or so a week of Nevada City, California, weed that I was selling to friends and classmates, I made enough for rent, food, and the rest of tuition. But as the rumor got around that recreational sales were going to be legalized soon, myself and my stoney acquaintances began to wonder what our own “black market” sales were going to look like? Granted, illegal sales were and are still a long way from disappearing, but we were still curious as to what it would look like if there was no need to sell weed from our own living rooms. Thanks to my grandmother, of all people, my career with cannabis was not quite over. Grandma had an old coworker who had just recently been hired at a local dispensary, and she was more than happy to hook me up with an interview. I suppose the rumors of my own smoking habits had reached my family before I intended. Regardless, I was excited. I nailed the interview and was emailed to report for two long days of training with the other new hires. From a class project I worked on about Reno's evolving drug culture. Those two days were filled to the brim with new knowledge. In an industry that dedicates entire curriculums to the plant, there was only so much I could absorb. We learned about the basics like sativa and indica, or indoor and outdoor. But we also learned about receptors in the mind that respond to the different kinds of cannabinoids. Cannabinoids are molecules found in the plant, which are also produced naturally in your brain. The new information was intimidating, but after about a month of shadowing and floor training, I was ready to run my own register. Or at least I believed I was. A screengrab for the Blum dispensary where I worked. I spent a large portion of the month of July shouting over the glass casing of my register and display. Not in anger or impatience. There were just so many people coming through the door and speaking to the budtenders. Ten registers in a room, all having their own conversations about the product. Answering questions about dosage, and strain, and medicinal benefits. Some people would wait in line two hours so that they could buy their own legal weed. The flow of new customers never seemed to stop. My eyes got tired from punching numbers into a screen. My feet hurt from standing 10 hours a day and I could barely speak anymore. It was hard work, but we loved every minute of it. My managers would go rent hotel rooms close to the store so they could get a couple hours of sleep before going right back to it. We were all giving our everything to this one cause. To get the city of Reno high as hell. It felt like we were at the center of the world. The loyal disciples of the first summer of legal weed in Reno. I never smoked at work. I felt like I could sell and count best when I was sober. My numbers showed the success of my work ethic and my drawer was always spot on. A lot of the older budtenders would hold genuine conversations with their customers, but not me. Lost time meant lost money. I moved a lot of weight over that counter. It was never a thought to me about what I was doing. People wanted product and I gave them some. Any ethical or moral thought was gone. We had too many real problems to deal with. Pro-marijuana websites were elated when Question 2 passed in the 2016 election, but there were soon a host of problems. When Question 2 was originally written up to be put on the 2016 ballot for Nevadans, it was understood that alcohol wholesalers in the state were to be given the rights of distribution from medical grow operations to retail storefronts. So when the Department of Taxation agreed to give licenses directly to those grow operations, and cut the alcohol wholesalers out of the middle, they were met with a lawsuit and an injunction. Only alcohol wholesalers were to be allowed to distribute the product. Of the seven applications turned in for distribution licenses by alcohol wholesalers, only two succeeded. The other five turned in incomplete applications. With sales exceeding expectations, we were running out of product, and running out of people to deliver us more. Customers began to get angry, and prices kept spiking. A lot of people thought that we could go out of business and lose our jobs, as the market seemed to be about to explode. But Governor Brian Sandoval saved Nevada's weed stash by declaring a “State of Emergency.” Licenses were to be given to the growers, and the city would have its weed once again. Although the problem seemed solved, the stress of the alcohol wholesalers appealing their lawsuit to the Nevada Supreme Court remained. We were back to work at a comfortable pace. Business carried on into the late summer and our great success in Midtown was not to go unrewarded. The owner of our store, and of the other four Blums in Oakland and Las Vegas, was throwing a party at her hilltop house in West Reno, and rumor had it that a special musical guest was going to show up. We were all bursting with curiosity. Our managers knew but they kept it close. We couldn’t get a word out of them. All they would give us were hints at the magnitude of the fame of whoever was coming. Apparently the owner, Heidi Loeb Hegerich, threw a party just like this one last year and was able to get John Legend to perform in her dining room. Another manager said that she told Jay-Z to “name his price,” for a half-hour performance at her Reno home, but Jay referred her to his no-house party rule. Heidi was something of an urban myth around the store. She’s a German immigrant who is thought to be in her 70s but has had enough plastic surgery to be passed off as in her early 50s. Her Facebook is filled with photos of her firing rounds from large weapons and doing Olympic lifts in a gym. She’s written a semi-autobiographical novel, where she hints that she was at one time carrying Elvis Presley’s love child. We were in awe of her, and couldn’t wait to find out who was coming to the party. A Snapchat moment from a 2017 Blum party during which employees rolled blunts. We all got our invites with dress code and address. As the date drew closer, Snoop Dogg’s name grew louder around the store. The Doggfather of West Coast Kush himself was rumored to be the headliner. What do I say if I meet Snoop? Are we going to smoke together? Do I trust myself to keep my composure in front of the most high? But any illusion of a chill kickback and some one on one time with Snoop was proved wrong by a well-maintained backyard filled with business suits. I don’t intend to complain at all about the hospitality of Heidi Loeb Hegerich. The backyard stood high on top of an insane view of the city, with all of the liquor and hors d'oeuvre that a kid could eat and drink. There was even a blunt rolling station, where employees of Blum Oakland rolled Backwood Cigars filled with Blue Dream for the partygoers. They were tremendous at it. A few kids from Oakland rolled for hours as tall white businessmen in expensive suits hopped into the front of the line. Rumors turned out to be true, and Snoop Dogg took center stage at the Blum party. Snoop Dogg was a mere ten feet away from us. He played all of the crowd favorites, as my co-workers swayed back and forth amidst the strong clouds of smoke. Everyone seemed to have a blunt in one hand, and their phone in the other. People had to make sure this moment wasn’t going to be lost to time. It had to be put on news feeds for the world to see. 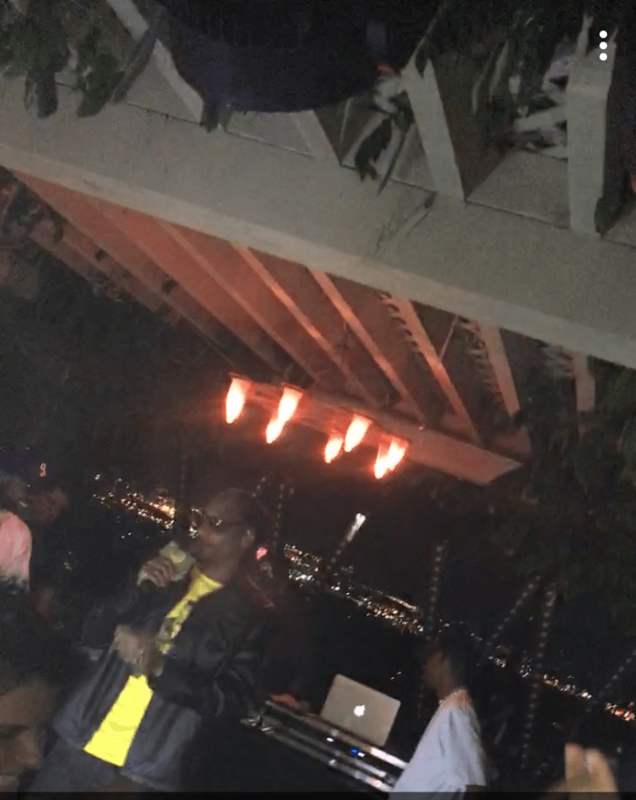 It’s not everyday you get to see Snoop Dogg in someone’s backyard. It may have been a pretentious sort of thought, or a genuine moment of internal disagreement, but something felt wrong. I slowly backed out of the silent and intoxicated crowd and wandered over to the blunt rolling station. The kids from Oakland were still there. They were arguing with a man who wanted them to roll him another blunt. They had been rolling all day and they just wanted to go see the show. I left feeling a little uneasy (and guilty), as I usually do after a night of indulgence. And I went back home with a different attitude about what I was doing and how the people above me were administering it. I went back to work after the party and didn’t quite feel that same magic walking in the front door that I had a month ago. The line at the door had shortened and the days became longer. I was beginning to feel uncomfortable with the questions I was being asked by customers. People with serious ailments weren’t finding the answer in cannabis. Some complained that they felt like the large doses that they were taking were actually making them intensely depressed. Most people were still happy and told me miracle stories about how I had changed their lives. I shed tears sometimes at how grateful people were for my help. But despite the encouraging words from those customers, I still knew that I was a long way from any real knowledge about these people and their bodies. I knew I was nowhere near qualified enough to be giving them some of the information that I was told to give them. When I brought this up tentatively to my managers, I was told not to worry, and that I was doing a great job. My drawer was always on count, and I was outselling the rest of the team, but I knew sales was not a calling that sat right in my soul. I quit Blum and I quit smoking weed for about three months or so. Although the impact of my time felt real, and was real to so many people, it’s hard to look past the underlying truth. The priority was money. With the alcohol wholesalers, with the governor, and with Heidi Loeb Hegerich herself, money comes first. The patients are hopefully a close second.